In our ever changing marketplace it seems that one thing remains constant. Most people prefer traditional looking homes. Although interior floor plans tend to be more on the contemporary side, it is important to most people to have a home that has a more "timeless" style on the exterior. At R.L. Diorio we team up with local architects to design a home for you that has both a "timeless" exterior with a floor plan suited for a 21st century family on the go. Our ability to do this is evident in the many homes we have built over the years. Add to this concept our committment to the highest quality construction and after move-in follow-up service and that makes us your choice for your next new home project. R.L. 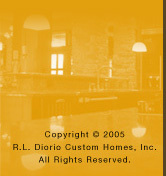 Diorio is always a favorite at the HBA Homearama Showcase of homes whenever it participates. Diorio's Homearama entries are a true testament of it's ability to be both innovative and practical in constructing a dream home of the utmost quality.